Starring David Arkin, Barbara Baxley, Ned Beatty, Karen Black, Ronee Blakley, Timothy Brown, Keith Carradine, Geraldine Chaplin, Robert DoQui, Shelley Duvall, Allen Garfield, Henry Gibson, Scott Glenn, Jeff Goldblum, Barbara Harris, David Hayward, Michael Murphy, Allan Nicholls, Dave Peel, Cristina Raines, Bert Remsen, Lily Tomlin, Gwen Welles, Keenan Wynn, James Dan Calvert, Donna Denton, Merle Kilgore, Carol McGinnis, Sheila Bailey, Patti Bryant, Richard Baskin, Jonnie Barnett, Vassar Clements, Misty Mountain Boys, Sue Barton, Elliott Gould, Julie Christie, Howard K. Smith. Joan Tewkesbury. Original Music Arlene Barnett, Jonnie Barnett, Karen Black, Ronee Blakley, Gary Busey, Juan Grizzle, Allan Nicholls, Dave Peel. No American director of the 1970s splits critical opinion like Robert Altman. Boosters regard him as the most original and independent of the batch of studio directors that (briefly) enjoyed the power to initiate and control projects with minimal corporate oversight. They see his film sets as fertile gardens of inspiration that allowed actors to shape the characters they play, with Altman supplying guidance and limits. Detractors charge Altman with permitting his large-scale ensemble shows to devolve into shapeless, diffuse mob scenes that expend a lot of energy without making a coherent point. That criticism best applies to what might be called Robert Altman's 'party' movies, the ones with large casts and generalized themes: Buffalo Bill and the Indians, HealtH, A Wedding, Dr. T and the Women. Altman's famous M*A*S*H and The Player may look loose but they're rigidly constructed by comparison. Altman's late career film Gosford Park has a big cast but is tightly scripted. The watershed picture is 1975's Nashville, a sprawling tale with several dozen major speaking parts and no dominant central character. The lengthy picture does without anything resembling a plot line. We instead watch as Altman's legion of characters meet, greet, interact, argue, cheat on their partners and con one another. The setting is the home of Country Music, an institution given about as much respect as pro wrestling; the competitive world of the Grand Ole Opry is positioned as a microcosm of America itself. What follows is merely the barest description of the roles and relationships in Nashville. Singing stars, their hangers-on and the eccentric hopefuls descend on Nashville, Tennessee. Diva Barbara Jean (Ronee Blakley) arrives by plane with her tightly wound manager-husband Barnett (Allen Garfield) and almost immediately lands in the hospital with a nervous breakdown. Star Haven Hamilton (Henry Gibson) behaves as behooves his demi-god status in the Country pantheon, and supports Barbara Jean while promoting his own celebrity. Haven's cynical mistress Lady Pearl (Barbara Baxley) resents being surrounded by politically ignorant non-Catholics. Famous singer Connie White (Karen Black) comes off as not very bright and painfully gullible, yet presents a carefully modulated image for her fans. Gospel singer Linnea Reese (Lily Tomlin) dotes on her two deaf children, while her philandering husband Del (Ned Beatty) works overtime trying to make deals. The rock trio Bill, Mary and Tom (Allan Nicholls, Cristina Raines & Keith Carradine) come to town to record. Mary is Bill's wife but she has become Tom's lover and the group is near breaking up. Constantly hitting on women, Tom phones Linnea for a hook-up. Del is busy conspiring with political contact man John Triplette (Michael Murphy) to recruit major talent for a public appearance by the wildcat "Replacement Party" Presidential hopeful Hal Philip Walker. The candidate is not seen but his annoying campaign truck cruises Nashville, broadcasting conservative speeches. Many others figure tangentially in the action. Waitress Sueleen Gay (Gwen Welles) is set on a singing career despite having no talent; plainspoken restaurant owner Wade (Robert DoQui) is the only man honest enough to tell her the truth. Wade is also not impressed by the black singing star Tommy Brown (Timothy Brown), who is more conservative than the rednecks in town. Obnoxious Brit Opal (Geraldine Chaplin) claims to be with the BBC but shows appalling manners and insensitivity while pursuing celebrities with her tape recorder. On the same hospital floor as Barbara Jean is the sick wife of elderly Mr. Green (Keenan Wynn). He meets Private Glenn Kelly (Scott Glenn), who seems nice but is definitely stalking the celebrity patient. Mr. Green's niece L.A. Joan (Shelley Duvall) is a determined groupie who abuses her uncle's hospitality and sleeps with several men on a casual basis. "Tricycle Man" (Jeff Goldblum) dresses oddly, rides a modified Harley and performs magic tricks. Addled runaway Albuquerque (Barbara Harris) is yet another hopeful convinced she has a future as a country star. She tries to crash exclusive backstage areas and proves an ongoing nuisance. The director with the largest and most loyal stock company of the golden '70s, Robert Altman exerted full control over his films while making his actors feel as if they had been freed from directorial restraint. For Altman casting is everything, and he collected quite a stable about him. Nashville can't afford expensive stars but has representatives of every step of his career since leaving Kansas. Barbara Baxley starred in Altman's forgotten science fiction film Countdown, Keith Carradine had a plum role in McCabe & Mrs. Miller, and so forth. Some of the actor/role linkups are refreshing. Former TV comedienne Lily Tomlin makes an impressive dramatic film debut, while big stars Elliott Gould and Julie Christie drop by for amusing cameos. Karen Black's Connie White doesn't believe that Christie could be a star: "Oh come on. She can't even comb her hair." Just the same, Altman consistently casts to type, a habit that works only when we agree with his taste and sense of humor. Ned Beatty is a chatty blowhard, Keith Carradine an ultra-cool ladykiller, Allen Garfield abrasive and uptight, Scott Glenn a true-blue soldier, and Michael Murphy a glad-handing political operative. Keenan Wynn is pulled in to play a sweet old guy whose life seems built on disappointment, and Robert DoQui has an interesting part with unexpected depth. But Altman also plays the Federico Fellini game, filling the screen with superfluous characters. Jeff Goldblum's silly kook is present just to up the on-screen freak quotient. Robert Altman's actresses praise him, which is surprising considering the kinds of dimwits and harpies he creates for his films. The director's marvelous discovery Shelley Duvall is called on to portray a grotesquely promiscuous groupie. Gwen Welles is a ditz so confused by her sad attempt to become a star that she falls back on a striptease to obtain at least some kind of approval. Geraldine Chaplin's (fake?) BBC reporter is clearly meant to represent the celebrity-mad excesses of the media, but the role still comes off as criminal cruelty to a fine actress. Altman snagged the services of big star Karen Black for just one week, only to make her singing celebrity seem both embarrassingly clueless and narcissistic. Authentic singing performer Ronee Blakley plays an unstable Loretta Lynn type, an emotional wreck 'hollowed out' by a profession that requires absurd displays of folksy insincerity. Her personality is so out of control that she believes she's some kind of goddess; her husband Barnett works overtime holding her together. We learn more about Robert Altman's shooting style through the extensive interviews on Criterion's disc. Multiple cameras were used to film large scenes with scores of characters. Using lessons learned in films like California Split, Altman had each of his actors individually miked for sound. This allowed him to stage complex chunks of group action, and sort things out later in post-production. Actors report that they were given essential cues to hit but were otherwise told to 'do what they wanted'. Michael Murphy explained that when he asked permission to try something, he was told to 'just do it' and not waste time in discussion. The scenes obtained with this kind of semi-improvisation were greatly changed in the editing room; having discrete audio for each speaker and all those angles allowed Altman a measure of editorial freedom. He could pare things back down to the basics of Tewkesbury's screenplay, or expand the input of individual characters at will. In this way Altman did a lot of his directing in the editorial suite. It's possible that Karen Black's part is so small because Altman didn't see her doing a great many interesting things. Some actors appear to have been given one bit of business in lieu of direction. Allen Garfield falls back on a stock phrase about being busy, Geraldine Chaplin chirps that she's with the BBC, and Barbara Harris prattles on about a fly swatter with a Red Spot. Yet it must be admitted that we are able to keep track of an unusually large number of characters; Altman has a highly developed skill for bringing clarity out of clutter. Did some things slip through Altman's freestyle improvisation method? Cristina Raines' Mary is an attractive, sympathetic singer deeply in love with Keith Carradine's Tom. It is frustrating when Mary's story fails to develop. To tell us how much she loves Tom, Mary simply chants, "I love you" six or seven times. Ironically, this same dialogue is used in the classic musical Singin' in the Rain to satirize bad moviemaking. Altman fashions a cynic's melting pot of American types, a group of caricatures to reveal the 'truth' about the country circa 1975. What we see is a lot of selfish and narcissistic behavior that makes us think that Country Music is a magnet for shallow and cruel people. Like or dislike the Grand Ole Opry culture, it can't possibly have the contempt for people shown here. Altman even said that Country Music fans are not likely to be pleased, and they weren't. Elia Kazan's A Face in the Crowd used its "Good Ol' Boy" media personality to push a warning about star worship and political demagoguery. Altman's comic satire switches gears to seriousness and suddenly wants us to accept it as a profound statement about "America." Various actors were encouraged to contribute their own songs for the film, some of them in concert with music supervisor Richard Baskin. Thus we have the work of Henry Gibson, whose grossly overdone caricature of an odious singing star also comes with bush league non-songs about empty patriotism. Karen Black's song is actually not at all bad -- it's as if Ms. Black were given the opportunity to be Tammy Wynette, an odd link back to her memorable performance idolizing the singer in Five Easy Pieces. Keith Carradine's folk-rock tunes are passable, if lightweight. Unfortunately, all of the so-so music here makes us remember the marvelous Leonard Cohen tunes that graced Altman's atmospheric McCabe and Mrs. Miller. Proving that Altman's entourage believed its own hype, Alan Rudolph and Baskin would immediately extend Keith Carradine's role as a 'singing legend' in Welcome to L.A.. Beyond the stylings of professional performer Ronee Blakley, Altman's picture is at its weakest when its Country stars can't put across a tune. And stacking up some loaded lyrics ("It Don't Worry Me", "200 Years") doesn't take the place of real social criticism. Neither does filling his soundtrack with the conservative blathering of the unseen Dark Horse candidate Hal Philip Walker. When in doubt, Altman cuts to the politician's public address truck as it cruises the city. It serves the same editorial function as the public address system from Altman's monster hit M*A*S*H'. Altman turns Nashville, Tennessee into a broad-canvas "Where's Waldo" mural, jamming as many of his actors into as many scenes as is humanly possible. Joan Tewkesbury's screenplay lopes from one giant set piece to the next, most of which involve at least twenty characters -- a multi-car freeway pileup, recording sessions, club night performances, The Grand Ole Opry, an amateur night that becomes a strip show. For some, Nashville is a transcendent experience, a portrait of a sick America in need of the healing power of communal consensus. Others see it as far less profound. The sudden violence that ends the film plays like a student film, an attempt to lend closure to a loose collection of character sketches. The much-praised final scene involves a shooting at a political rally. Barbara Harris' character Albuquerque stems the panic and chaos by snatching up a microphone and galvanizing the stunned audience with her voice. Albuquerque was previously seen as a pathetic fan, but now she delivers the film's most powerful performance. For many it succeeds as a call for Americans to "all pull together" to erase political differences. For others the entire exercise rings hollow, falling back on waving flags and emotional grandstanding. Nashville was the recipient of a huge boost from the then- dominant critic Pauline Kael, who had a habit of lavishing uncritical praise on certain directors (Bertolucci, Peckinpah). The influential critic was partially responsible for keeping Altman's career afloat through the 1970s. We're told that Paramount was not bullish on Nashville until Altman forced their hand by pre-screening it for Kael, who proceeded to 'pre-review' it in print, calling it a masterpiece even before it was finished. The resulting media hubbub made Nashville a must-see picture. It's now a touchstone movie for the Altman fans that enjoy the improvisational free-for-alls of his lively stock company. 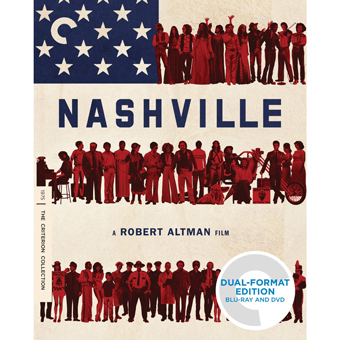 Criterion's Blu-ray + DVD of Nashville is a deluxe offering that makes this "intimate epic" a fascinating study of a director with a wholly distinctive style. The newly restored HD image is in fine shape, showing just how well cameraman Paul Lohman follows focus with Altman's ubiquitous long lenses. The film's original four-track stereo has been remixed to 5.1 surround DTS-HD Master Audio. The Dual-Format edition contains all of the extras in both Blu-ray (1 disc) and Standard def DVD (2 discs). Robert Altman is heard on a full audio commentary, while archival interviews show him relaxed and candid about his film. A thorough and comprehensive new documentary has input from assistant director Alan Rudolph, screenwriter Joan Tewkesbury and actors Allan Nichols, Michael Murphy, Lily Tomlin and Keith Carradine. We also see BTS footage from the set and a demo audition of Keith Carradine singing his songs. A trailer finishes the disc extras. In the insert booklet film critic Molly Haskell finds almost as many words of praise for Nashville as did Pauline Kael. With valued assistance from correspondent Shaun K. Chang. Supplements: Audio commentary with Robert Altman, new docu featuring interviews with actors Keith Carradine, Michael Murphy, Allan Nicholls, and Lily Tomlin, assistant director Alan Rudolph, and screenwriter Joan Tewkesbury; archival interviews with Altman, Behind-the-scenes footage, Demos of Carradine singing his songs from the film, Trailer, Insert booklet with an essay by film critic Molly Haskell.